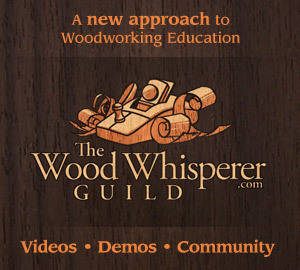 Go check it out and build along next year: www.thewoodwhisperer.com/wfc. This year the donations will be going to The Jimmy Fund. The project for this year is the a Resin Cast Memory Frame. When Marc announced this years project I immediately knew what I wanted to build, heck it has been on my to do list for 5 years! My brother got my son this awesome TMNT vinyl decal about 5 years ago when my son was really big into Ninja Turtles. Because we were renting at the time, and still are, I didn't want to put this up on the wall. It would have been destroyed trying to remove it when we moved. So the plan all along was to put it on a piece of plywood and hang it up. Well time as usual got the better of me and I found myself 5 years later still wanting to get this on the wall. Now was the perfect opportunity for me to get it done because it was going to benefit multiple people. I have held on to this ¼" piece of scrap plywood for several years with this project in mind. I even moved it across the country in 2016 when I moved from Texas to South Carolina. I know I know, I could have gotten rid of it and got a new piece when I got to South Carolina. But why? This was a great piece for this project. I cut it down to the size I needed which was 30" x 13". This gave me enough room to put a frame around it and put the decal inside it. The measurements are less important for you because you will need to cut it to the size you need to fit your decal or item you want inside the frame. After I cut down the plywood I needed a frame. So I raided my scrap bin and the only thing I had was left overs from the dining room table. These pieces were perfect because it has a little meaning to us since I built the table for my wife and used the same wood to build something for my kids. I used my Kreg Tools Precision Miter Gauge on my table saw to cut the 45° miters and these things were dead on. I have never used the miter gauge for miters before and after this I will be doing it a lot more. I was under a major time crunch to finish this project and I only had about 1-2 hours a night to work on it. The deadline to have photos uploaded was Oct. 31st. I decided to use my DAP Rapid Fuse Wood Adhesive. I'm so glad I did because it held the mitered corners together nicely. I was less concerned with the strength of the miters themselves because I was applying the plywood to the back and filling the frame with epoxy. With that all together it would be more than enough to keep the miters closed long term. Once the frame was all glued together I needed to route a rabbit for the plywood back panel. I used my Rockler adjustable rabbiting bit to router a ⅜" rabbit around the inside of the frame. You just want to make sure you back panel will fit and you want enough overhang that the epoxy will not seep out once it is poured. Next I took my back panel and glued it into place with DAP Rapid Fuse. I also painted and finished the frame to my desirable color. I used General Finishes Antique White Milk Paint and High Performance Satin for the top coat. I then applied my vinyl decal in preparation for the resin. There are many options out there for Epoxy Resin but only one that I have used multiple times, Art Resin. Art Resin is non-yellowing so over the life of the cured epoxy it should stay crystal clear. It is non-toxic and non-hazardous with no VOCs, yes you read that correctly NO VOCs. I poured the Epoxy in my house and no one could really tell I did. 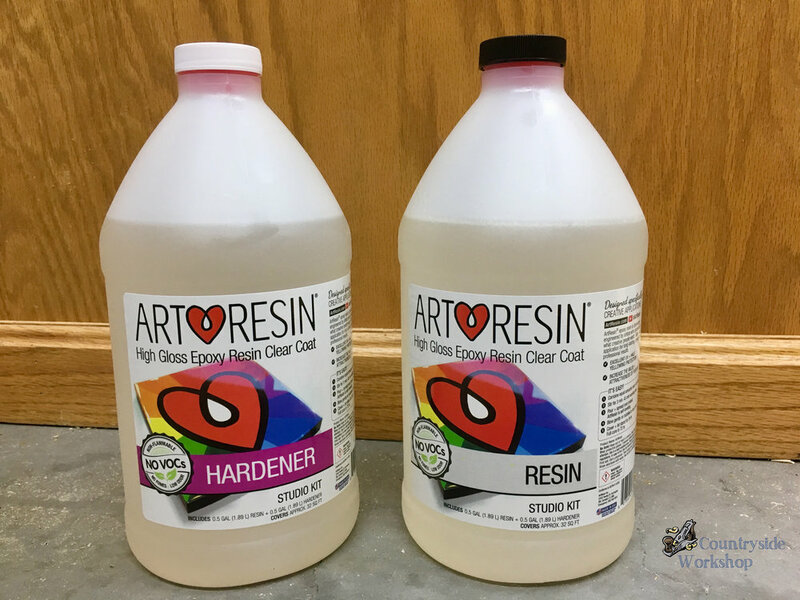 Art Resin is mixed in a 1:1 ratio or a 50/50 mix of hardener to resin. I used the handy Usage Calculator on Art Resins website to tell me just how much material I needed. Based on the length and width of the inside dimensions of my frame the calculator said I need 12 oz. total (6 oz hardener + 6 oz resin). This will give me the ⅛" thick recommended coat. If you want it thicker than that then you need to build it up in ⅛" layers. When you pour your resin you might have to push it around a bit to get it to cover the whole area. Don't worry, as long as your piece is level in all directions then the resin will level out. You will then need to pop the air bubbles that sit in the epoxy. I highly recommend you get a torch for this if you are covering a large piece. I used a lighter and it left a few blemishes in the resin. Only because it doesn't pop the bubbles fast enough when you have to cover a large piece. Finally you need to cover your art and let it for 24 hours to dry. Covering it just protects the fresh resin from debris falling in it. Once it was dry I decided to add a dust cover to the back. This prevents dust, dirt, and bugs from getting into the frame. I did this by applying spray adhesive to butcher paper and then laying my frame down on top of the paper and working the bubbles out. Once the glue was dry I cut it to fit the frame. Lastly it was time to stamp and sign the back (and leave a little note for my kids when they get older). Just like that I can call this piece done and mark it off my to-do list. My kids loved it and are super excited to have it up on the wall in their playroom. Thank you for taking the time to read this tutorial. We all take risks on a daily basis, some are just more severe than the others. Some risks we take without ever even thinking about it. I would say it is a proud day in any father's life (well any woodworker's) when their child asks to build something for their birthday. If you plan to sell your crafts online then you have to be able to compete and stand out in the crowd of other people selling their items.